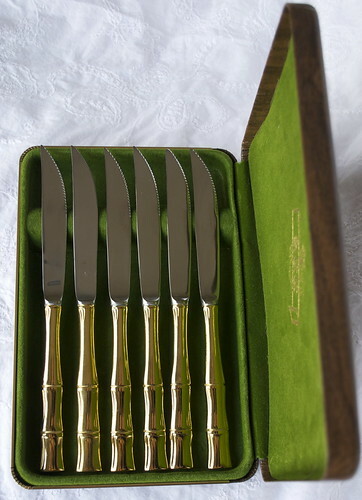 I've never seen anything like these Vintage Gold Bamboo Steak Knives before. I almost don't want to part with them since they are so unique. They are very substantial weighing individually at 3 ounces, and has a rich, substantial feel to it. Only the handle is gold plated and in a bamboo-style which will easily fit almost any setting or decor. - Knives are individually wrapped in plastic. - Weight of the whole box with knives: 2lbs 1.7oz. You can purchase this at Shop Proper Hunt, my new Etsy store! Thanks!